The Retirement Plan Documents package helps you streamline your entire plan document preparation process. ftwilliam.com offers all of the popular retirement plan types (e.g., ESOP, 401(a), and 403(b) documents) in prototype and volume submitter formats*. The Retirement Plan Documents package from ftwilliam.com combines powerful technology, in-house attorney-written documents, and world class customer support to provide you with a first class document generation solution. With features like ZZZ Defaults, batch generation of annual notices and required amendments, and extensive error checking, you will be able to minimize your data entry and save time as you generate documents for your clients. We also offer add-on tools, such as ftwPortal Pro, Spanish Forms Package, and ftwPro Amend to increase your efficiency even more when working in the Plan Document module. Plus free conversion assistance is offered for some vendor’s documents – contact ftwilliam.com support or your sales consultant for more information. Integration. Our Plan Documents modules are integrated with the other ftwilliam.com modules to ensure effortless data flow. Easy to use forms and amendments. Most of the forms and amendments can easily be generated using either the Batch Print or Group Print features. The Batch Print feature permits you to print amendments for all of your clients in a few easy steps. E-signatures available with purchase of ftwPortal Pro. E-sign any document using our software. Streamlined data import and export. The exclusive ftwLink feature provides an XML based interface for interfacing with your plan information. Using ftwLink you can add and edit plan information, extract checklist answers, and generate plan documents using a single, easy to use XML interface. Free updates. All document updates and amendments are provided at no extra cost. Extensive on-line error correction. While we cannot guarantee that each combination of checklist responses will result in the plan that meets the qualification requirements of the Internal Revenue Code and ERISA, our on-line error correction will identify all required responses and will highlight most conflicting responses. Streamlined data entry. When entering data, items for which no entry is required will appear shaded and will not allow data entry. For example, if matching contributions are not allowed in a 401(k) plan, all questions dealing with matching contributions will be shaded. 55AutoFill technology. 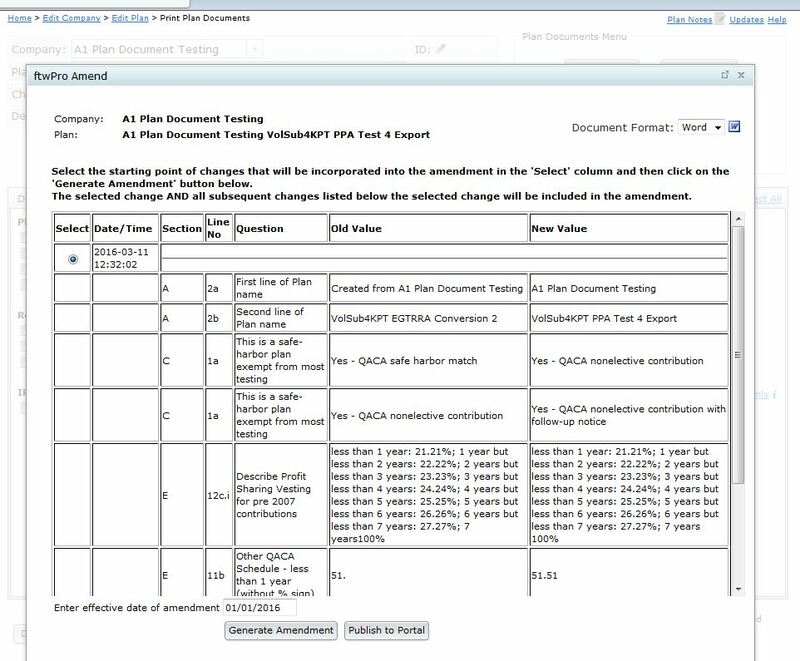 With 55AutoFill, completion of plan document checklists is made easy by automatically downloading all of the available information from the most recently completed 5500 forms. Plan highlights document. Contains a concise summary of major plan terms. Custom language. 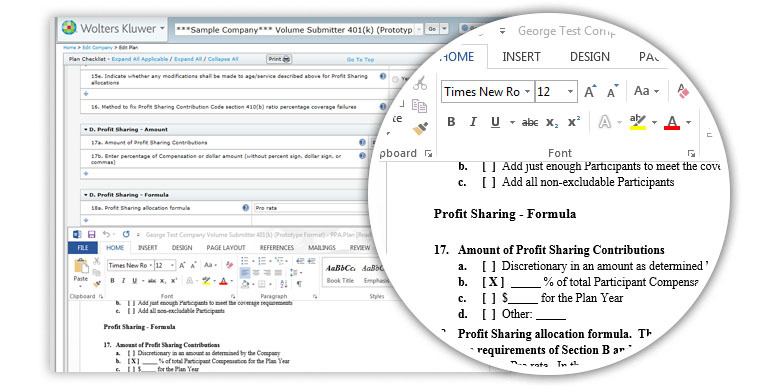 Since the documents are delivered in rtf format, you may perform extensive customization of each document. Unlimited checklist templates. Using the “Clone Me” feature you may establish an unlimited number of custom default checklists. Export plan specifications. With this unique, powerful feature customers are given the ability to download all of their plan specifications with the click of a button in Excel-compatible format. Help. Nearly every checklist question provides instant context-sensitive help. Our retirement plan documents are available both via subscription and per-plan pricing options. Discuss with your ftwilliam.com sales consultant which might be the best option for you. * The IRS opinion letters will reflect CCH INCORPORATED DBA FTWILLIAM.COM as the sponsor of the prototype/volume submitter plans and the IRS-required language preceding the signature line on the prototype documents will also contain our name and address. In addition, a representative from CCH INCORPORATED DBA FTWILLIAM.COM will also appear on the form 2848 (power of attorney) for each volume submitter document that is submitted for favorable letter. If you have purchased a retirement documents subscription, you can add-on a Spanish Forms package for an additional cost. 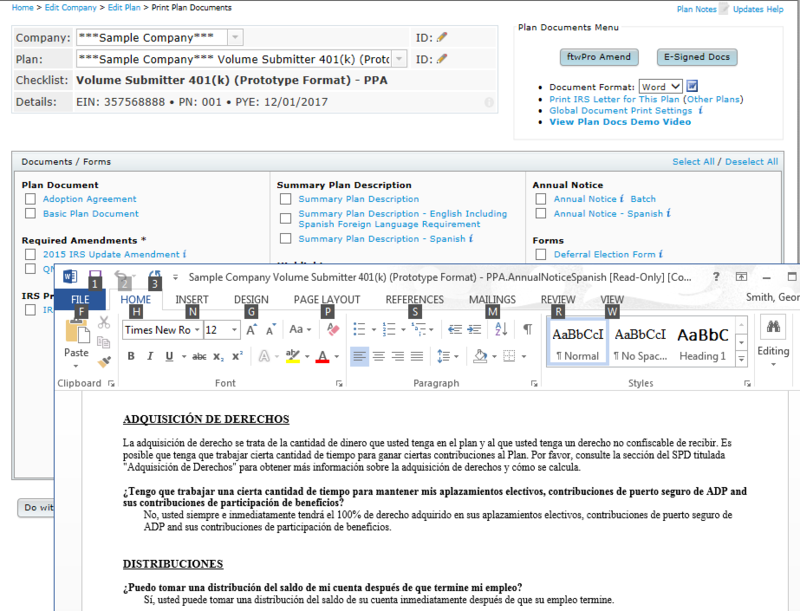 This suite of documents includes translated Spanish versions of the following forms for Defined Contribution Plans: Summary Plan Description, Annual Notice (Safe Harbor, Auto-Enroll, SIMPLE and QDIA), Participant Highlights, Special Tax Notice, SMMs for new Mandatory and Optional Amendments, and more! ftwPro Amend, our automated amendment module, is available for any retirement or welfare plan in a prototype format (plans with adoption agreements) and limited IDPs. In order to generate an amendment, you simply update the online checklist of the plan for the changes you want in your amendment, enter an effective date and the system will generate a customized formal record of action, summary of material modifications and amendment. For an additional annual cost this feature will be made available for all retirement and welfare prototype style documents and in a limited format for IDP formatted plan types. Please contact us if you would like this feature added to your account.